I Live in the UK and I have ME IBS and a heart condition. I just wanted to say, Thank you so much, I found you on youtube a couple of months ago and in that small time you have changed my life. Because of my ME I get awful pain in all my joints, which I have suffered with for many years, since doing your classes online I have noticed such a massive difference in my whole body and I can finally get a good nights sleep without waking in agony. Also I feel fantastic with in my self, I can walk for longer with no pain, I can bend and stretch with complete ease and my life is generally easier and more enjoyable 🙂 So I look forward to continuing with you classes. The only thing I will ask is I suffer from a lot of pain in my shoulders and shoulder blades and they knot up really bad and its very painful, are there any classes that you could recommend of yours that target the shoulder area? I’m so glad that you found Namaste Yoga on YouTube and I am delighted to hear that the consistency in your yoga practice has changed your life. That is amazing that because of your yoga practice you have noticed such a massive difference in your body and that you can get a good night’s sleep without waking up in pain. How fabulous that you can walk for longer without pain and bend and stretch with ease. No wonder your life is more enjoyable. Thank you for your loyalty as you continue with Namaste Yoga. As always, I am a Ph.D. in communications and cultural studies and not a medical doctor, so with a persistent problem like pain in your shoulders it is probably a good idea to get it checked by a medical doctor and/or medical professional. Here is a blog post I did on discerning pain when you should stop practice and seek medical attention. Today I will show you how to practice Eagle’s arms to release tension from your shoulder blades. Check out this recent blog post we did with tons of variations on Eagle Arms. I created these out of necessity for myself when recovery from a motor vehicle accident. My students love these videos. I think you will too. We also just released a 10 classes on the membership site called Shoulder Shorts. 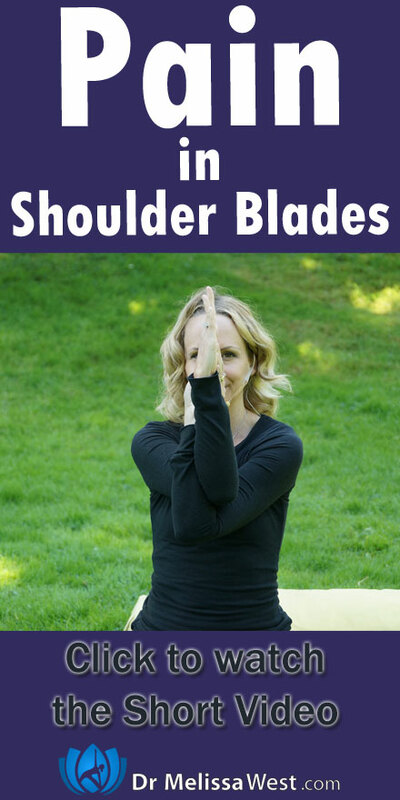 These are ten 20-30 minute classes designed to mobilize and release tension from your shoulders. These classes are a membership site exclusive.